For those who haven’t caught up yet, Rise of the Dragons is Book Two of The Five Kingdoms of Severi, a fantasy/drama series available to read for free over at BigWorldNetwork. Book One: The Keys of Destiny will be released as en eBook, audio book, and print early March of this year. So excited. More on that later on. “Everyone and everything that had to do with my grandfather only brings bad luck and misfortune with it,” Alden stated, avoiding Edwin’s gaze and instead concentrating his sight on the winding path ahead. “I am not bad luck and misfortune,” Edwin shot, urging his horse to catch up with the prince’s white mare. “Yes you are. You are all the bad luck and misfortune in the world wrapped into one very annoying package,” Alden teased, washing away the bad taste that had snuck into his mouth. He forced back a smile and tugged at the reigns, urging his horse to a full gallop. “I am not!” Edwin cried out in his defense, trying to catch up once more. “First we discover rock golems exist and, must I remind you that they tried to kill us, then dragons, when I ended up more or less dead, and now elves? If they exist, I am willing to bet they will be trying to kill us as well,” Alden commented over his shoulder, grateful for the fact that Edwin hadn’t pushed the subject about his grandfather further. “What’s next, mermaids?” he added, fighting back a rhetorical laugh. “This can’t be right,” Edwin said, snapping Alden out of his teasing banter. The serious and surprised tone in his voice brought Alden to a halt. Alden nudged his horse to retrace its steps and rejoined Edwin a few feet down the path. “What is it?” he asked, but the moment the words left his lips he already knew the answer. Both stared at the smoke in the distance, the peaks of several huts and tents stood out through the tree tops beckoning them. “It’s a village,” Alden muttered, one hand tightening its hold on the reigns and the other reaching for the hilt of his sword hanging at his side. “There isn’t supposed to be a village here,” Edwin eyed the prince, catching that the prince had already picked up on that fact. “None of the maps I looked over have a village marked in this area,” he continued, and a frown spread across Alden’s stern expression. The prince unsheathed his sword and cursed at their rotten luck. It seemed like the last peaceful hours they had wallowed in had come to an end. “We should go around it,” Edwin suggested, eyeing the surrounding trees and forks in the path, forming a new route in his mind. “If we must, but I still think barging in at full gallop isn’t the best choice!” Edwin shouted at the already retreating figure of the prince. Who is being stubborn now? he thought to himself. He eyed the peaks again and felt an unsettling feeling start to form in the pit of his stomach. With one final sigh of defeat, he tugged at the reigns. His horse tore down the path through the forest after Alden and the first hint of civilization they had seen in the entire day since they’d left the tavern. This scene is quite special to me because I slipped in something that pertains to book three of this series. 🙂 Did you catch it? Thanks for stopping by and hope you enjoyed this excerpt as much as I enjoyed writing it. Many of you know my first book/series The Five Kingdoms of Severi has come to an end and is awaiting publication. But instead of waiting I went on and started Book Two in the Trilogy, Rise of the Dragons. This is the novel I finished during NANOWRIMO last November and is currently undergoing editing. You can read Season 1 (first 10 chapters with 11 and 12 the following weeks) for FREE over at BigWorldNetwork. Below is an excerpt, series information, and banner image. Enjoy! The battle against Lucius and his horde has been won, but at a heavy price. Edwin’s father is trapped in Terdune with no way back. The only hope in saving him lies in the very same shattered pieces of the mirror Edwin destroyed during his fight with Lucius. The oracles are left with no clues about the mirrors, their hidden secrets lost with Lucius’ death. Together Edwin and Alden must travel deeper into the neighboring kingdoms of Severi in search of the creators of the magical mirrors. Their quest will require skill and magic for though evil was imprisoned once more in the dark lands of Terdune evil has a way of slipping back in. The battle was won but the war for their souls is about to begin; the lines between Evil and Good will blur as the quest for what was lost unfolds. The doors of the throne room opened, and Marcus looked up from the scrolls he had been overlooking. He took in the oracle’s riled expression and handed the scrolls to one of his advisors. With a wave of his hand, he dismissed them before addressing his new visitor. “Tabitha, what brings you back so early? How was your stay at the fort of the Fourth Kingdom?” he asked getting to the point of the matter. “Yes, my King. I was awakened during my second night there by a strange feeling,” Tabitha continued. “I rushed to the caretaker’s side fearing the worst, and caught him with this. Once I was finished questioning him, I immediately rode back at full gallop.” She pointed at the object and stepped back to await her king’s orders. “No, sire. You are the first I came to,” Tabitha replied, her expression hiding nothing. “Good, have the rest of the oracles meet me at once, but keep this secret from the Queen. She need not know of it just yet,” Marcus ordered, turning the necklace in his hands. It was evident that the old laws were failing them and magical items were once more finding their way into the hands of the caretakers and inhabitants of Severi. “What must I not know about?” Toren asked, standing in the middle of the doorway. She stepped inside, the double doors shutting behind her with a definite thump. The King and Tabitha remained still, unsure what to say. Toren moved to join Tabitha and her eyes fell on the object in her husband’s hands. She rushed toward him, snatching the object from his grasp. She shifted her gaze from the King, to Tabitha, and back to the magical necklace. She had seen this necklace before. It had been haunting her visions as of late. She swallowed hard, and settled her eyes on the oracle. This month is really turning into quite a busy one. 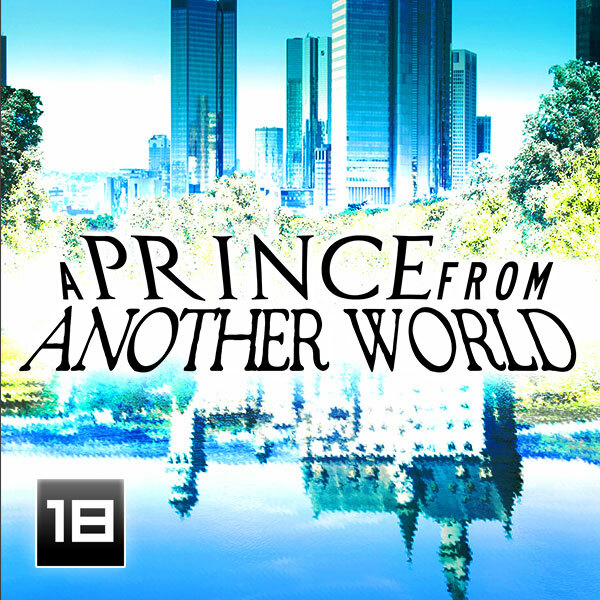 Season two of my gay romance/fantasy/modern fantasy series, A Prince From Another World, is set to start this week with new episodes being released every Monday. Like last season I will be doing a promo launch where I reveal some nifty stuff about the series. This time around the launch will only be five days, but I have tons of neat stuff that we didn’t do last launch. And for those following my NANOWRIMO entries those will still continue along side the launch. So without further ado here is our first promo launch. Eli stared at the sight in front of him unsure of what to make of it all; the unfamiliar words the older man had spoken still rung in his ears. The words brought a sense of calm and familiarity over him and he chanced a glance at the prince. The moment of brief repose vanished. Brayden’s bleeding increased, the bed was practically covered in the black liquid and it oozed to the floor near Eli’s feet. Eli tore his gaze from the gunk on the floor and grabbed a handful of towels from the cabinets, pressing them against Brayden’s wound. The liquid seeped through the soft material and stung his fingers. He winced at the surge that ran up his wrists and snapped his hands back. Eli stared at the fading black marks on his fingertips. He ignored the strange shift in the air and reached for more clean towels, and repeated the process, pressing them against Brayden’s wound, this time ensuring none of the black gunk touched his flesh. Eli stepped back, the meaning of Grayson’s words lost to him among the worry and fear he felt for Brayden. His eyes scanned the prince’s pale face. Was there really nothing he could do? Was the prince going to die? He fought against the horrible thoughts filling his mind and stepped closer to Brayden’s bed only to have Grayson nudge him back. “Come on, Brayden, snap out of it. Don’t let it win!” Grayson yelled at the unconscious prince, pressing his hand harder against the young man’s chest. There was still no change in the prince. Grayson cursed under his breath and repeated the spell, the gold in his eyes flashing brighter than before. This time the spell seemed to work. Brayden’s body turned still, the sheets and gown completely black. Grayson yanked Brayden’s soiled gown off and picked him up in one smooth motion then quickly carried the naked prince to the other side of the room, setting him on a small couch. He grabbed a clean gown and spread it over the prince. Everything the black liquid had touched suddenly caught on fire. The room filled with a shrill, ear-splitting scream. Eli and Grayson covered their ears as the sound rose in pitch. Small trails of blood ran down their fingers, their eardrums rupturing from the noise. The screaming increased still and Eli dropped to his knees, the pain in his ears unbearable. Read more over at BigWorldNetwork. Monday marks the twelfth episode and the conclusion of Season One. Season Two is scheduled to start in November and available through BigWorldNetwork. For those who are just stopping by A Prince from Another World is a gay/fantasy/modern fantasy series. A few minutes later, Eli was walking back to the bench Ryan was sitting on. It wasn’t until he was almost upon his friend that he noticed Ryan was not alone. Eli regarded the strange man, who looked around his late thirties, early forties, sitting next to his friend. This stranger held Eli’s drawing pad in his broad hands, causing Eli to freeze. Ryan and the elder man looked to be in a deep conversation. Eli decided to keep moving, pushing the feeling in his gut that the man was the beginning of something he would rather not be a part of. “Hey, Eli, this guy is Grayson, and he was admiring your artwork. He thought it was mine, but I told him you were the talented one,” Ryan said with a proud smile on his face; he had always admired Eli’s ability to draw. “Yeah, you were always more the speak-what’s-on-your-mind type of guy,” Eli teased as he looked skeptically at the man. The man’s long hair and beard made him seem older than Eli initially thought, but added a sense of calmness to his features. Eli traded a drink for a hotdog and took a seat next to his friend, his stomach once more reminding him of how hungry he was. “Nice to meet you, Grayson,” Eli addressed the man awkwardly, unsure how to make small talk and then decided on concentrating on finishing his food and drink. “I have to get going. It was nice to finally get to meet you up close, Eli. That is some lovely work you have there,” Grayson replied after a while, getting to his feet and bowing at both Ryan and Eli. He set the drawing pad down, glanced once more at the portrait of a young man, and left, quickly disappearing into the crowd, not waiting to see if the meaning behind his words was understood. “That was weird,” Eli told Ryan as Grayson’s words stirred a familiar sense of having heard his voice before, somewhere long ago. “What was weird? You in khaki pants?” Ryan mocked as he shoved the last piece of his hotdog into his mouth, ketchup and mustard oozing out to stain his chin. Eli gently shoved his friend and handed him a napkin, though the desire to let him walk around with mustard and ketchup on his face was more enticing by the second. He shoved the nagging questions the man’s words had stirred and decided to enjoy the short amount of time left of their outing. “I was in the middle of job hunting when you dragged me here,” Eli reminded his friend. Done eating, he rested his back on the bench and gazed once more around the park. The park really was quite beautiful in a simple yet practical way. The lake was the biggest attraction, with its deep greens and blue waters floating calmly under an elegant red oak walkway bridge. People crowded the wooden construction on all sides and peppered the waters with rented rowboats. His eyes lingered on the lake, its calm waters reminding him of his dream. How he wished it was the same lake. “Come on, I have to be getting back,” Eli said with a hint of sadness in his voice. He stuffed his drawing pad and pencil back into his bag and flipped it over his shoulder. “But we haven’t even seen the lake up close or walked the plank,” Ryan complained. He tossed the dirty napkin into a wastebasket and pointed at the lake, but Eli had already turned away. Eli was ready to leave, with Ryan or without him. His mother was be expecting him home soon and Ryan’s pirate jokes would not be a viable excuse for tardiness this time around. He waved dismissively at Ryan and continued walking. He was halfway to the bike rack when he felt, rather than heard, voices creep into his mind. He couldn’t quite make them out and he turned his head slightly to the side. Was he losing his mind? He closed his eyes in an attempt to focus on the words then quickly opened them again as one word became very vivid and clear. Hope you enjoyed this excerpt. Eli and Ryan’s banter is one of my favorite, reminds me of my old friends from high school. 🙂 Don’t forget to check back, we have lots more reviews and excerpts to share along with the series cover for book two of The Five Kingdoms of Severi series. It is that time again for another shameless plug, I mean another excerpt of my online fantasy/drama series, The Five Kingdoms of Severi. Remember this story is free to read over at BigWorldNetwork. No need to create a login or anything to read the story. And to celebrate its season 4 launch I will be creating some artwork for this series and extra content that will be available in the book. So without further delay here is an excerpt of season 4, episode 1. Toren woke in Bardimus’s arms. The sound of the battle below her shook the last strands of confusion and she bolted to her feet. She staggered towards the edge of the tower. Toren turned her attention to Lucius’s army and extended her hand. She ignored the blood trailing down the side of her face and concentrated. She found the spell she needed and chanted the words. The grass beyond the castle grew. It swayed against the horde stomping over it and clung to the attackers’ legs, slithering beneath their enchanted armor. The thin strands snapped back into the earth, cutting into the skin of their unsuspecting targets. Movement behind her told her the rest of the oracles had regained consciousness. Lenora joined Toren and commanded her own magic to take form. The golden dust seeped from her open hand and turned black taking the form of a raven. The small bird squawked and took flight, speckles of gold shimmering in its black feathers. Once in midair, the raven dived towards the approaching army; its feathers expanded, and it replicated into multiple other ravens until the sky lost color under the increasing number. Lucius’s men, along with ogres and goblins, tore through the clearing and right into the path of the magical birds. The ravens dug their talons into the men and creatures’ eyes, gnashing and tearing into the delicate tissue. The unlucky ones stumbled to the ground and were pinned to the earth by the knights’ endless arrows. 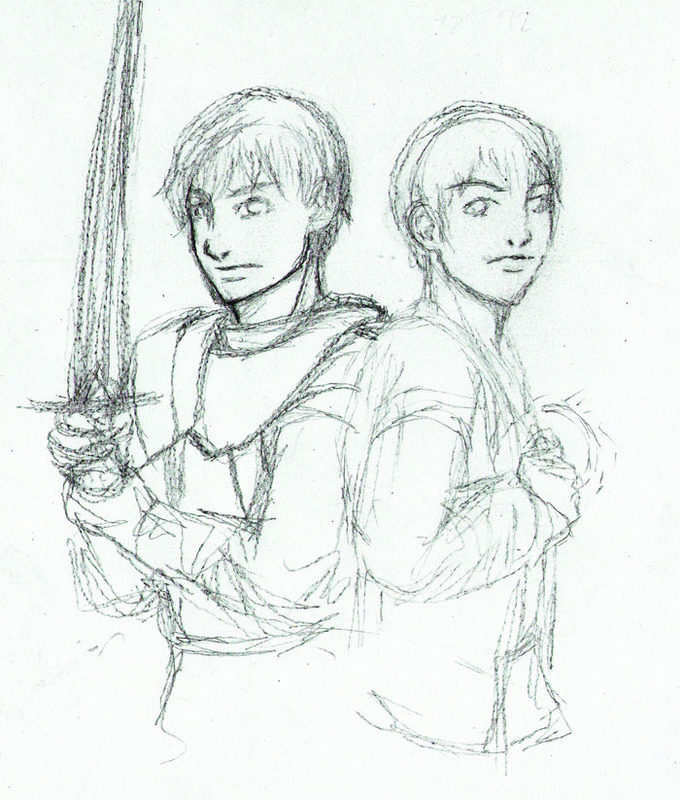 Their magical armor turned useless with the rest of their body exposed to the oracles’ magic and the expert knights.